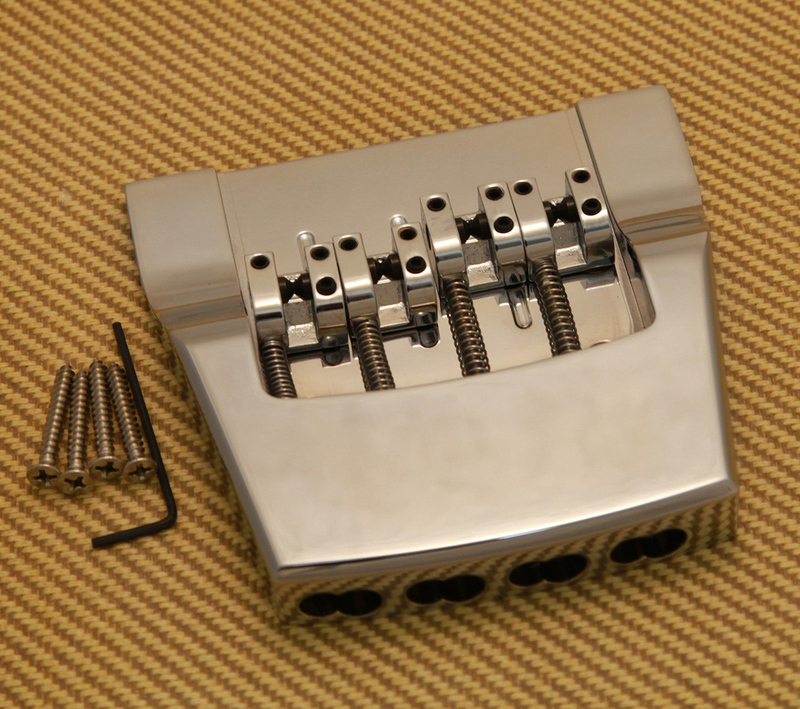 Hipshot chrome bridge for most Ric® 4000 series basses. This is a direct replacement unit that won’t mar your valuable instrument. Heavy duty design is machined from aluminum and offers precise intonation, independent string height and even, side-to-side string spacing adjustments. Solid contact between the bridge and your guitar body means no “lift off,” giving each note superb tone, punch and sustain. Includes mounting screws and allen wrench. Made in the USA. 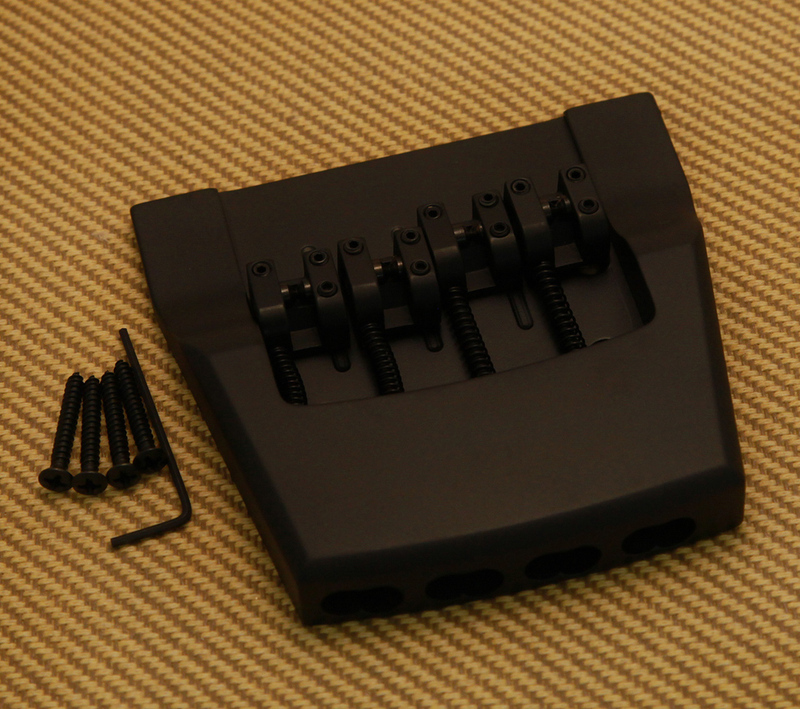 Hipshot black bridge for most Ric® 4000 series basses. This is a direct replacement unit that won’t mar your valuable instrument. Heavy duty design is machined from aluminum and offers precise intonation, independent string height and even, side-to-side string spacing adjustments. Solid contact between the bridge and your guitar body means no “lift off,” giving each note superb tone, punch and sustain. Includes mounting screws and allen wrench. Made in the USA. 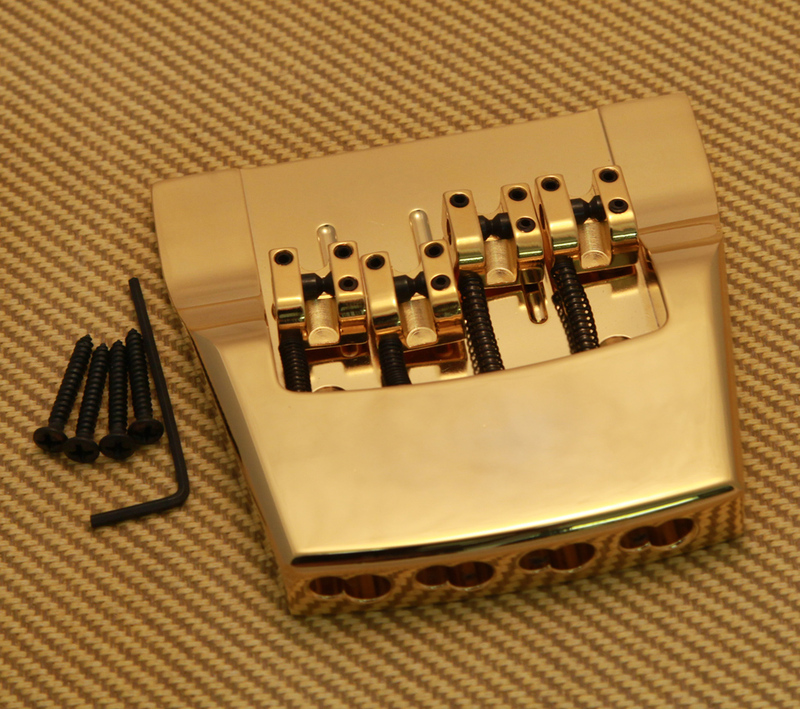 Hipshot gold bridge for most Ric® 4000 series basses. This is a direct replacement unit that won’t mar your valuable instrument. Heavy duty design is machined from aluminum and offers precise intonation, independent string height and even, side-to-side string spacing adjustments. Solid contact between the bridge and your guitar body means no “lift off,” giving each note superb tone, punch and sustain. Includes mounting screws and allen wrench. Made in the USA. 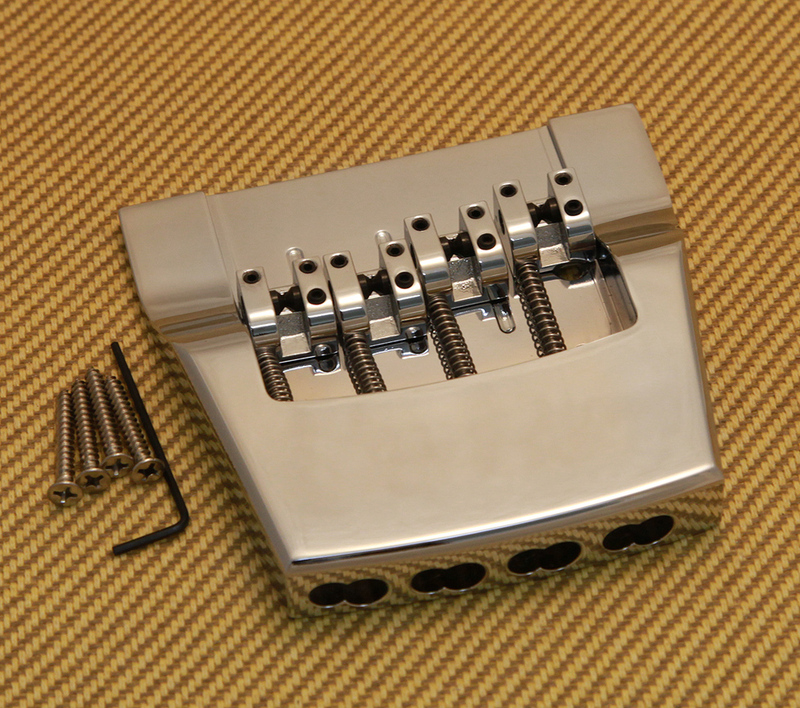 Hipshot chrome bridge for most Ric® 4000 series basses. This is a direct replacement unit that won’t mar your valuable instrument. Heavy duty design is machined from solid brass and offers precise intonation, independent string height and even, side-to-side string spacing adjustments. Solid contact between the bridge and your guitar body means no “lift off,” giving each note superb tone, punch and sustain. Includes mounting screws and allen wrench. Made in the USA. 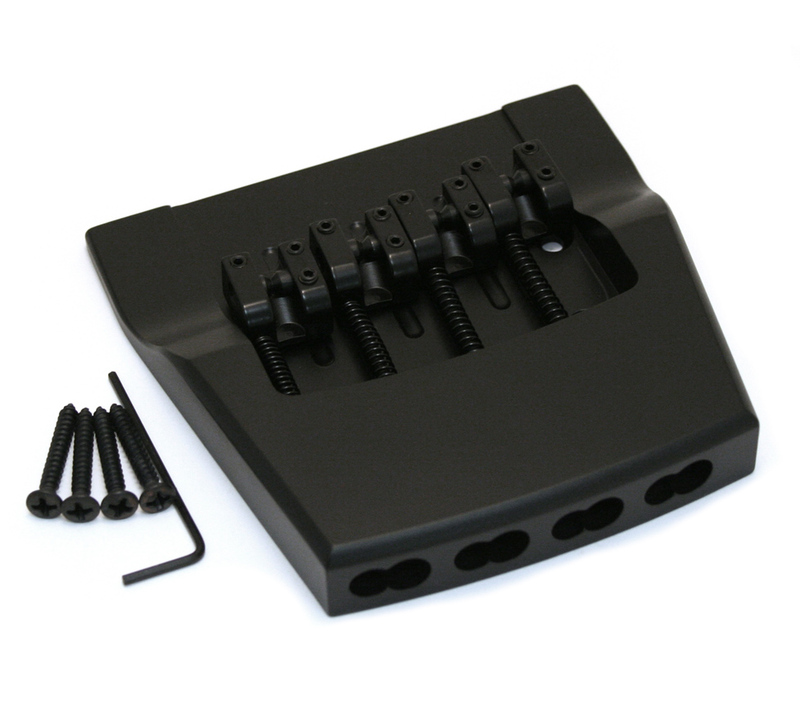 Hipshot black bridge for most Ric® 4000 series basses. This is a direct replacement unit that won’t mar your valuable instrument. Heavy duty design is machined from solid brass and offers precise intonation, independent string height and even, side-to-side string spacing adjustments. Solid contact between the bridge and your guitar body means no “lift off,” giving each note superb tone, punch and sustain. Includes mounting screws and allen wrench. Made in the USA. 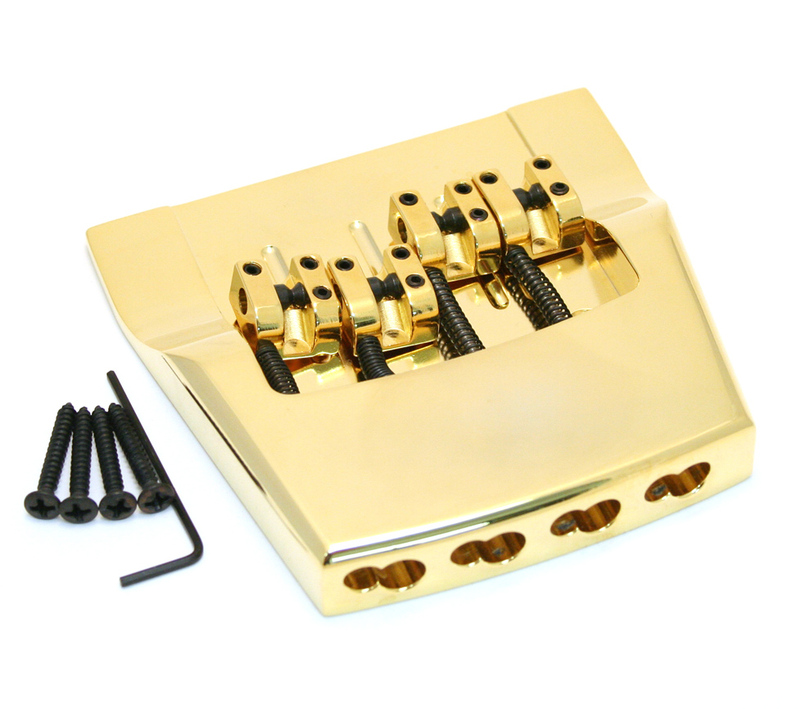 Hipshot gold bridge for most Ric® 4000 series basses. This is a direct replacement unit that won’t mar your valuable instrument. Heavy duty design is machined from solid brass and offers precise intonation, independent string height and even, side-to-side string spacing adjustments. Solid contact between the bridge and your guitar body means no “lift off,” giving each note superb tone, punch and sustain. Includes mounting screws and allen wrench. Made in the USA.